Venerable Luon Sovath - activist Buddhist monk who documented some events of the film. WHEN CHRIS KELLY went on a trip to Cambodian in 2006 he wasn’t expecting to end up spending most of the next decade there filming what would become his documentary A Cambodian Spring. The film, released in Irish cinemas last week, tells the story of a group of residents of the Boeung Kak Lake in Phnom Penh, who were faced with their homes being lost to corrupt developers as the the lake was pumped right into their homes, flooding and destroying them. With government backing, the developers have attempted to pay off the residents with meagre sums to turn the land into real estate property. But the residents, who have lived in the area for years and worked hard to buy their homes, aren’t interested in moving. The documentary follows their story through the years 2009 to 2015 as well as documenting the turmoil in Cambodian politics including the return of the major opposition party leader, and months of post-electoral protests that saw many killed and arrested. But when he first arrived in the country, Kelly didn’t intend to film what he saw there. He was simply curious. Kelly did his research but found that many documentaries concentrated on Cambodia’s past – the Khmer Rouge; the Killing Fields – but not so much on modern Cambodia. He was interested in the land rights issues and so the Derry-born filmmaker organised a three-month filming trip with funding from the Irish Film Board and Northern Ireland Screen. It was meant to be a short documentary – talking heads, some images of the situation playing out – but it quickly turned into something more. As the three months were coming to a close, Kelly realised he couldn’t stop. The residents’ ongoing fight for their human fights compelled him to stay. Soon Kelly found himself doing odd jobs for The Guardian and other publications for documentary and journalism work in Thailand and Burma in order to keep the project going. He ended up covering stories that looked at the connection between the seafood trade and slavery in the Thai fishing industry and the Rohingya refugee crisis. It was work he had never done before, coming from a role in a production house in Belfast that filmed commercials, music videos and short films. But the project, and the relationships he had formed with the people he was documenting in Cambodia, kept him in the region. “It was very difficult to leave the country – you want to be there the whole time,” he said. Other than necessary work visits to other parts of south-east Asia to help with funding, Kelly would spend the next six years in Cambodia filming what would be A Cambodian Spring. While the film’s main focus is on the residents and the forces displayed against them, three distinct characters take the forefront. Boeung Kak Lake residents Toul Srey Pov and Tep Vanny show the strength of the women of their community taking the fight to the developers who continue to pump the lake water and sand into their land. Tep Vanny - one of the protagonists of the film who is currently serving a prison sentence for her activism. Some of the most emotional parts of the film include when Toul Srey Pov’s young daughter and the rest of the children of the village demonstrate with megaphones and signboards for their mothers’ freedom after many of the protesting women are put in jail. The elation when they are freed is joyful and Buddhist Monk, Venerable Luon Sovath, is there to document it all with his array of smartphones and camcorders. Some of the footage in the documentary comes directly from Sovath’s own footage of filming injustices in Cambodia. The activist monk has been joining Kelly on the promotional tour of the documentary, spreading the word about the ongoing turmoil in his country. And though Kelly left the country with his hundreds of hours of footage in 2015, he said things have not gotten better for Cambodia. “There is currently no press freedom,” he said. Many of the native press organisations have been shut down by Prime Minister Hun Sen’s authoritarian government that saw the Boeung Kak Lake residents lose their land and homes. He adds that most people who come as tourists, as he once did over a decade ago, won’t be aware of what is going on. And because he was an outsider who then became deeply involved, he could only present the film in that way. At the time, being a foreigner helped with filming: he was left alone mostly – except when he encountered difficulties trying to film officials and the like from the ruling party. 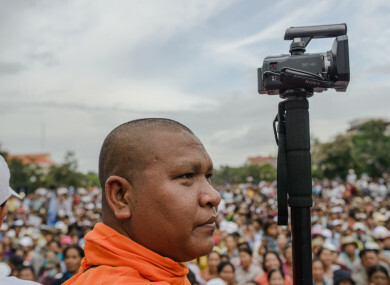 “Generally as a foreigner we had no real intimidation from the authorities,” he said - which is a different story from Cambodia today as many foreign reporters are harassed and dissuaded from filming in the country. Many of the fixers and Cambodian reporters who helped Kelly with his journey are now in prison under disputed espionage charges relating to their own press work. He hopes the film will do its bit to help a current case being built against Cambodia’s prime minister Hun Sen for his government’s land grabbing techniques. He said his team are also working with Global Witness and other organisations to help people like Tep Vanny who is currently in prison for protesting. During one point in the film, when the 2013-2014 Cambodian protests against Hun Sen’s government were taking place, a bullet from a Cambodian police officer hits a young man in the head, killing him. The young man had been throwing stones at the police and Kelly was only three feet away from him at the time. Though he had training in how to operate in a hostile environment, Kelly says he had a “moral responsibility” to film the chaos and upheavals, regardless of potential safety concerns. “It’s disturbing to have someone killed right in front of you, but I was there with a camera and my mission was to film.” He said anything less would have been in conflict with his responsibility to tell what he could of the Cambodian peoples’ story. But at the end of the day, all he could do was “tell the story as I understood it” and hope that the right people might see it. A Cambodian Spring is out now in Irish cinemas. Email “How a trip to Cambodia turned into an almost ten year project for this Irish filmmaker”. Feedback on “How a trip to Cambodia turned into an almost ten year project for this Irish filmmaker”.